This box actively protects your collection from oxidation and ageing thanks to the INTERCEPT® material inside. Suited to protecting coins, medals and paper. 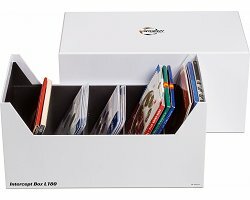 Suitable for coin sets, postcards, letters, stockcards, documents etc., up to 180 x 160 mm (7 x 6 1/4") in size. Overall size: 331 x 160 x 185 mm (13 x 6 1/4 x 7 1/4"). The way an INTERCEPT® box works is based on over 30 years of patented INTERCEPT® technology: the copper particles contained in the material permanently bond with corrosive gases and create a neutralised atmosphere in the shortest time possible, protecting the coins and documents from tarnishing (guaranteed protection for up to 15 years!). This method has been proven in line with approved DIN, EN, ISO and ASTM standards. In order to prolong the effectiveness of the INTERCEPT® box beyond 15 years, it is recommended that you close the box immediately after use and avoid opening it frequently. Este artigo foi introduzido em Quarta 10 Janeiro, 2018.